Oh my god this is going to be so gross. Thank freaking god Anointed Procession is rotating out before this rotates in. I don't think so. Since it says 'instead' that seems like it would just replace the effect and not add to it. Probably will be a rules headache. 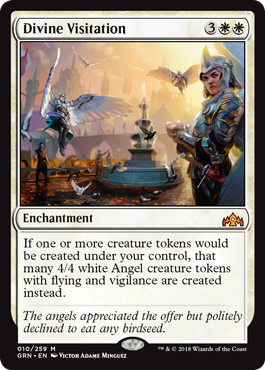 Not exactly, because its replacing the tokens with specific tokens even if its redundant, like replacing an angel token with an angel token of the same body/color/abilities. Its intentionally made to interact with token makers that make smaller tokens in order to make bigger tokens. So for example you could have Brimaz, King of Oreskos with this enchantment. Every time he blocks or attacks, he creates a 4/4 body instead of a 1/1 body. So insanely good. Buy them up early, because this will be a very popular card.